3.5-oz (100-gram) balls of Naturally Tussock 8-ply yarn. Each ball contains approximately 202 yards. 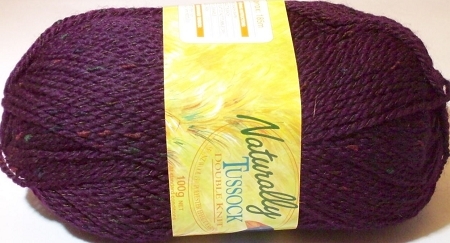 Tussock is a colorful and versatile wool yarn, and is great for felting. Great yardage on each ball. 85% Pure New Zealand Wool, 15% Polyester Effect Yarn. 22 stitches= 4" on US size 3-6 knitting needles. This is good yarn. I had done the Sheep Afghan which came in a kit. Now I have a client and am knitting the same one. This, and the grey tweed, I use for the background.